Search for a team in your area by entering your zip code below! Labor for Our Revolution statement in Support of "A Day Without Immigrants"
Time and time again our community is called upon to vote for the next Deporter-in-Chief, whether Obama or Trump, who will shape immigration policy for the next four to eight years. Each election, we’re promised that if we vote for the Democrats, they will give us immigration reform. When their promises go unfulfilled--when Obama deports 3 million immigrants or when Trump expands his power to deport and terrorize our communities--what do we do? We strike. Long enough have we voted, marched in DC, and gone to court to protect the morsels of protection that we have; longer still have we endured pain as our communities are exploited, unrecognized, shamed, and torn apart. Let’s be clear. We are not striking to make the Republicans like us or to pass legislation that is in our favor. We are not striking because we want to remove Trump’s oppressive executive orders. We are striking because our fight is not in DC--it's in every home, business, and industry that takes advantage of our labor and consumption. By striking, we make it clear that this country cannot function without immigrants. We build confidence that through non-cooperation, we can force this country to recognize us and realize that it depends on us. It is not until the United States accepts that it cannot sustain itself without immigrant labor that we will be able to win permanent protection, dignity, and respect. On February 16th, the immigrant community demonstrated their readiness and willingness to self-organize. The first Day Without Immigrants made waves all over the media. Now, Cosecha is pushing to organize a series of intensifying strikes. We will start with one day, but we are going for seven--a week without immigrants. We will end with dignity, respect, and permanent protection. We are fighting for a new day of justice, reconciliation and unity for our immigrant communities. Cosecha’s demands are permanent protection, dignity, and respect for the migrant community in this country. When we say permanent protection, we envision a change in the treatment of immigrants in this country. We visualize a future where immigrants are able to work and travel freely without the risk or fear of deportation. A future where we can walk the streets of this country with the recognition that we are a part of it. A future where we are not treated as outsiders, where our communities are not criminalized, and where we don’t have to abide by the narrative of a model immigrant. How will workers be protected? We want to make sure workers that go on strike are protected. This takes continuous preparation and communication and an understanding that you are not striking alone. 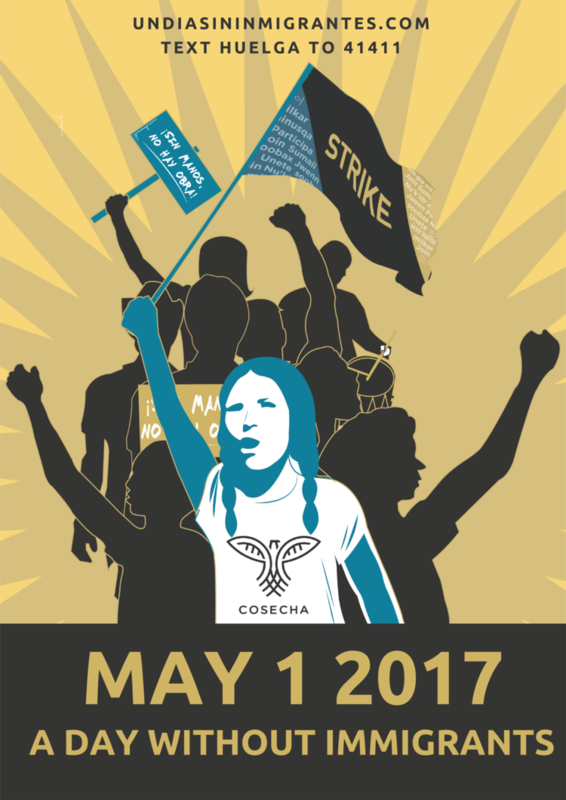 Cosecha is organizing an extensive network of legal support that can respond to unfair repercussions of striking. Workers will be protected through a strike fund that will help workers meet their essential needs during the strike. Cosecha will also provide necessary information in preparation of the strike so workers know their rights. Is this strike for immigrants only? Click here to enter zip code. Almost 350,000 service workers plan to strike on May 1, a traditional day for labor activism across the world, in the most direct attempt yet by organized labor to capture the energy from a resurgent wave of activism across the country since the election of Donald Trump. Tens of thousands of members of a powerful California branch of the Service Employees International Union will participate in the strike, according to David Huerta, the president of the chapter. 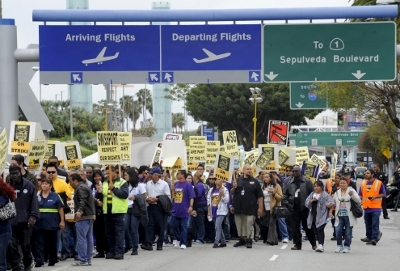 Members of SEIU United Service Workers West protest during May Day demonstrations at Los Angeles International Airport in 2012. Since Donald Trump’s election, there has been no shortage of wildcat strikes by groups disproportionately affected by his administration’s policies. But this time around, organized labor is driving the effort. According to a coalition of groups leading the strike, more than 300,000 food chain workers and 40,000 unionized service workers have said they will walk off the job so far. Huerta’s union chapter represents tens of thousands of workers, including janitors, security officers and airport staff, while the Food Chain Workers Alliance, which represents workers throughout the food industry, says hundreds of thousands of its non-unionized members have committed to striking. 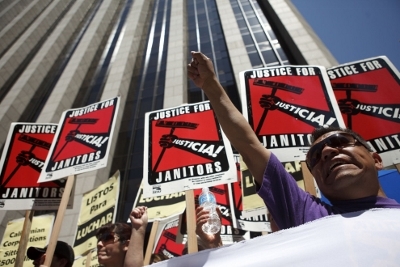 Best known for its creative and militant organizing, Huerta’s SEIU United Service Workers West local was one of the forces behind the successful campaign to unionize janitors in the 1990’s, which many see as the model for today’s wave of fast-food organizing. The Food Chain Workers Alliance, for its part, has built a nationwide network of workers across the food system, from farm fields to restaurant kitchens. 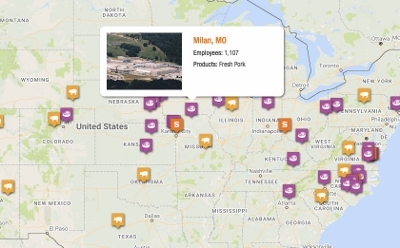 Speaking by phone from Milan, Missouri, organizer Axel Fuentes, of the Rural Community Workers Alliance, told BuzzFeed News that a thousand workers at a pork plant in the town will be striking May 1. Fuentes provides services to meat-processing workers in three towns in the northern part of Missouri, most of whom are immigrants and refugees. Fuentes said he has never seen workers express a desire to go on strike in his ten years of organizing, but on May Day, the majority of workers at the local Smithfield meat processing plant have pledged not to go into work, shutting down operations. They also plan to keep their children home from school and not to shop, he said. 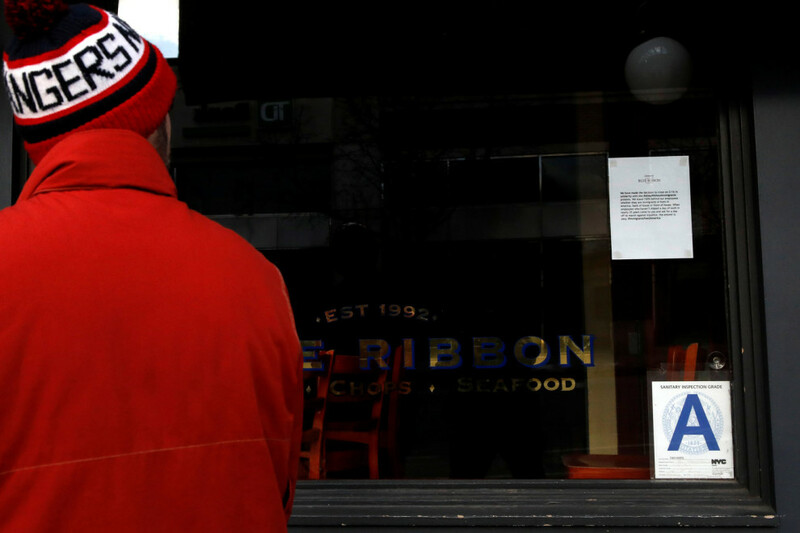 A sign posted on the window of a Brooklyn restaurant states they are closed in solidarity with the “A Day Without Immigrants” protests in New York, February 16, 2017. The Restaurant Opportunities Center (ROC) United, a food industry worker advocacy group, will also be participating in the strike, according to Saru Jayaraman, its co-director. ROC United and its network of restaurant owners and workers were instrumental in organizing the recent Day Without Immigrants protest, which shuttered hundreds of restaurants in cities across the country. America’s last major general strike was the first such Day Without Immigrants, in 2006, in which more than a million workers struck. 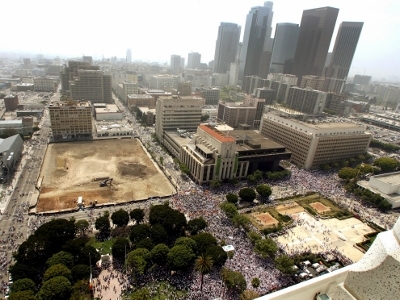 Workers mass in front of City Hall in Los Angeles, May 1, 2006, as part of “A Day Without Immigrants,” a nationwide demonstration to protest proposed immigration law. 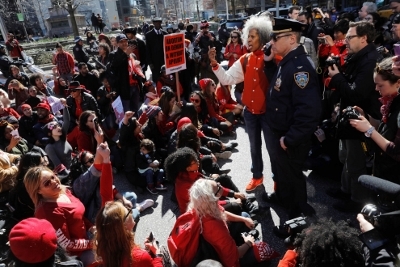 The plans for May 1 this year, and the organizations pushing them, highlight the role of so-called alt-labor groups, which can move faster than their larger, richer and more powerful institutional peers. Jayaraman, from ROC United, said groups like hers have more flexibility to call for their members to stop work, while established unions feel a need to tread carefully. That wariness means no national union has yet called on its workers to join a general strike, even though plenty of their ground-level leaders are actively involved in the upcoming protests. “This is a strike from below, from the bottom of the economy,” Gross said of the May 1 action. The same migrant and immigrant constituency that struck eleven years ago will mobilize this year, joined by the Black Lives Matter movement, native sovereignty rights groups, and organizations Voces de La Frontera and Movimiento Cosecha. Since Trump’s election, a strike by the New York Taxi Workers Alliance has led to a consumer boycott of Uber; a one-day work-stoppage by New York City bodega owners rallied the city around its Yemeni business owners; February’s Day Without Immigrants shut down food service in urban centers; and the Women’s Strike this month closed schools and filled streets. But Jayaraman dismissed the idea of ‘protest fatigue’ among her membership, which has turned out in high numbers for marches and strikes numerous times in recent months. Millions of immigrants, both documented and undocumented, who lead hard working and productive lives, are also union members. Donald Trump launched his political campaign in 2015 with a racist attack on Mexican immigrants, painting them as rapists and murderers. He made attacks on our Muslim sisters and brothers his political trademark -- even going so far as to propose a religious test for immigration. This kind of race baiting and immigrant bashing has a long history in our country – a consistent attempt by business elites to divide working class people in order to advance their pro-corporate agenda. will march in cities and towns all across the country. We pledge to support these protests and will urge our organizations' leaders and members to participate in whatever way we can. We call on the academic community to live up to the promise of higher learning by halting business as usual on May Day as an act of solidarity. While the nation’s workforce pauses to engage in a day of action, universities must pause as well; for staff, adjuncts and student workers on our campuses know well the severity of neoliberal policies and the precarization of work conditions, while students are already facing the terror of ICE raids.